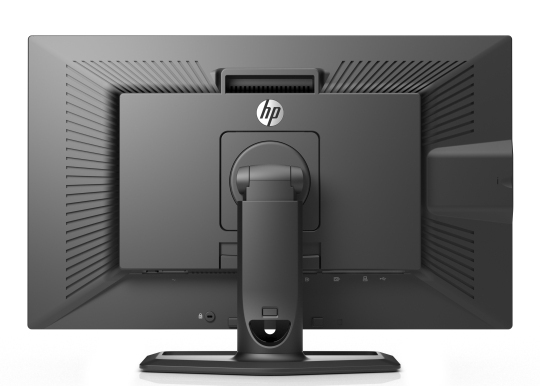 It's been a little over a year since we first reviewed HP's 27" ZR2740w monitor. This formed part of a new ZR series of screens from HP with sizes available of 20, 21.5, 24 and 27 inches, and had impressed us in many areas. You can read our full review from October 2011 for more information and our thoughts about the screen at the time. Now a year on we have been presented with an updated version of the ZR2740w. This was first brought to our attention by readers of TFTCentral, and in relation to a review conducted by Czechoslovakian website Extrahardware.cz. They had identified a new revision of the ZR2740w, characterised most notably by a seemingly lighter AG coating. This was positive news as it would help avoid the overly aggressive and grainy appearance of the older AG coating which has been widely used for several years on IPS technology screens. In recent months we have started to see newer IPS models emerge with a lighter AG coating which is positive news for the market. It seems HP have decided to update their screen as well. After checking with HP product teams we were told that there was indeed a minor change made to the panel to reduce sparkle mura, which was brought about by an improvement to the surface treatment. We were told that this change was done within the same product code and with nothing specific to identify a new version. This was done sometime during 2012 which gives rise to what we will refer to here as the ZR2740w v2. We have been sent a brand new sample by HP which has a manufactured date of September 2012. Any stock samples from after this date should be using this new panel revision and feature the lighter AG coating. In fact the sample reviewed by Extrahardware.cz was dated January 2012 so it is likely that most stock manufactured this year is of the new revision. HP haven't changed the model number or provided anything really to separate the new from the old version. We will refer to it in this review as the ZR2740w v2 but that is not a naming scheme known or acknowledged by HP. If you're specifically looking for the new version you just need to make sure that the stock being supplied is recent and you should be ok. We will look at the changes during the course of this review, as well as test this new version from a performance perspective. Some of what we said in our original review still stands of course so we won't re-write everything here. We have copied and pasted some information from the original review here (e.g. when talking about the design and stand etc) but this is a complete review in its own right. We will take this opportunity to complete some further tests which we have added to our review structure since the original review was published too. The ZR2740w offers a limited range of connections which is presumably a cost control exercise. There are 1x Dual-link DVI-D and 1x DisplayPort available. There are no D-sub or HDMI interfaces available although these may have been left off since they are unable to support the full native resolution of the display. However, it would still have been useful to include them I think for connecting external devices where the image could then be interpolated. The digital connections are HDCP certified for encrypted content. The screen is packaged with the cables for DL-DVI and DisplayPort at least. Nothing has changed here with the new v2 apart from a change to the screen coating. The ZR2740w comes in an all black design, with matte plastics used for the bezel and screen casing as well as for the stand and base. There is a small silver coloured HP logo in the centre of the top bezel and in the bottom left hand corner a badge saying 'HP ZR2740w'. The bezel is thick at ~22mm along the sides and top, and thicker still at the bottom at ~30mm. Comparing the bezel and design of the ZR2740w with the smaller ZR2240w the difference is obvious, and the screen looks a bit bulkier and less sleek as a result. It looks a bit like the ZR2240w's bigger, more chunky brother. The panel is also inset ~10mm behind the protruding bezel. The panel coating is a new lighter matte anti-glare (AG) coating. Some users complain about many IPS panels having an overly aggressive and grainy looking coating. Personally I have never found them to be too bad but it can of course be subjective and depends on your uses. Even on the old version of this screen we had commented that the coating seems to be a little lighter than on some of the other models we've seen such as the Dell U2410 and the NEC P241W for example, with a slightly less grainy feel. However, improvements have been made here further to reduce the grainy feel and the coating is now nice and light. It is very comparable to what we have seen on a couple of other modern IPS panels like the Dell U2713HM for instance. We will talk a bit more about this change later on in the review. There is a reasonable height adjustment available which allows you to adjust the height within a range of 105mm. At the lowest setting the bottom of the screen is 45mm from the level of the desk. In fact at this lowest setting the height adjustment clicks into place and is locked. This is designed so that you can package and carry it more easily. There is a small plastic button on the back of the stand you can press to release the adjustment again. At the highest adjustment the bottom of the screen is 150mm above the height of the desk. The minimum and maximum range is shown in the photos above. The movement is smooth but pretty stiff to use. The tilt range of the screen is very wide as shown above, allowing you to obtain a comfortable angle depending on your working conditions. The movement is smooth and easy to use here. You may notice that the side profile of the screen is quite a bit thinner than the HZ24W model. This is thanks to the use of W-LED backlighting instead of a CCFL unit like on the old model. However, it is actually quite chunky compared with some other modern LED backlit displays we have seen. The screen offers a rotate function as shown above in case you want to switch between landscape and portrait modes. This might be useful on a smaller model but I do question its real value on larger screens like this. The movement of this is quite smooth and fairly easy to use. The screens side to side swivel is smooth also but a little stiffer to operate. The base does maintain its position on the desk when you make the movements though. The screen materials are of a good quality and the design is attractive in my opinion. 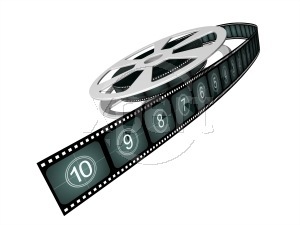 There is a feint hum from the screen if you listen very closely but nothing which you'd notice in normal use. It stays nice and cool during use thanks to the low energy W-LED backlighting. The left hand side features two USB 2.0 ports for quick connection of external devices. Always useful to see I think. Just behind this there is a small panel which pulls out to tell you some information about your screen such as product number, serial number, manufactured date and revision. Importantly here it tells you the manufactured date, and in this case we have a sample from September 2012 which is from the updated revision. The sample reviewed by Extrahardware.cz was dated January 2012 so it is likely that most stock manufactured this year is of the new revision (i.e. new panel and screen coating). The lack of an OSD menu is a bit of a shame really and has presumably been done to help cut costs. Without it, there are no preset modes for different uses, no colour temperature presets like we saw on the ZR2240w model, and no control over the contrast setting or RGB channels directly from the screen itself. During a calibration the only hardware changes you are going to be able to make are to the brightness. We had been quite impressed by the wealth of options when testing the smaller ZR2240w model but we don't have anything like dynamic contrast ratio, overdrive control, aspect ratio control etc here. A shame it was all left off I think. One option to provide a little bit more control over your display is HP's Display Assistant Utility (latest is v2.06 Rev A, dated 6 March 2012) . We didn't test this when we last looked at the ZR2740w but it does provide some functionality to control the screen via your PC. Of course it doesn't change the fact that the screen lacks some hardware features like preset modes, aspect ratio control and dynamic contrast, but it does at least provide some further settings to play with if you need. Within the software you are presented with several options in the interface which allow you control brightness, contrast, white point, desktop partition and auto pivot. In fact while connected to the ZR2740w the contrast and white point options are not available. In fact the only control you have is over the brightness setting, just as you would by using the hardware buttons on the screen. At least here though it tells you a setting you are at between 0 and 100%. Sadly the software doesn't give you any control over RGB levels which would have been useful for calibration. The settings for desktop partitioning and pivot adjustments might be useful to some people though at least. We have re-run these tests again based on the updated revision, although results were very comparable to the original review. 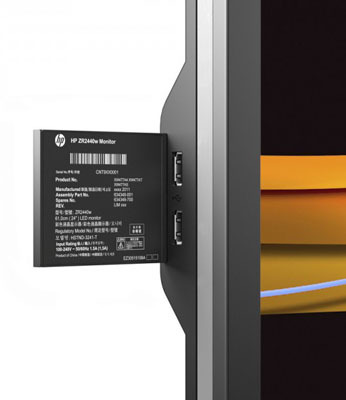 The HP ZR2740w originally used an LG.Display LM270WQ1-SDDA H-IPS panel when the model was first released and it seemed that this module was perhaps designed and produced for HP exclusively. We had seen previous incarnations of the LM270WQ1 panel before. Both the SLA1 and SDA2 versions however feature a glossy panel coating and have been used in models such as the Apple 27" Cinema Display and Hazro's HZ27WC, HZ27WA and HZ27WD. At the time this new SDDA revision of the module featured a matte AG coating however and is clearly quite different to the other previous revisions. HP have now slightly updated the panel being used and the v2 version of the ZR2740w now features an LM270WQ1-SDDB revision. They have changed from A to B here in the revision reference. This in itself suggests not a massive change as it's still fundamentally the same type of panel, just with a minor change in the revision. The panel is capable on paper of producing 1.07 billion colours according to HP's specs. We have been unable to verify the panel spec sheet for this particular module, and it is not one which has been used anywhere else before. Given that the SLA1 version offered a 1.07 billion colour palette as well, it's logical to think that the SDDA and SDDB panels are of the same type. This would mean that the panels colour palette comes from an 8-bit native panel, with an additional Frame Rate Control (FRC) control stage added. This simulates a "10-bit" panel and colour depth but it is not a true 10-bit panel. Given the relatively low cost (compared with high end professional displays with 10-bit support) of this model as well, it is reasonable to make this assumption since true 10-bit panels are rare and generally very expensive. 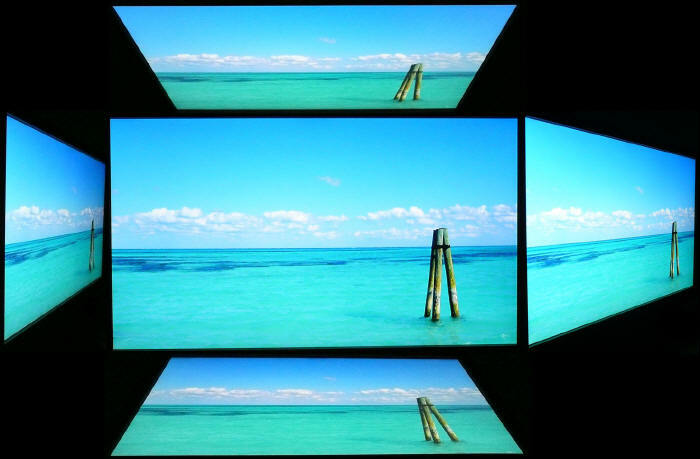 Above: view of the panel used in original (top) and new (bottom) versions of the screen. The screen coating on the ZR2740w is the main area of interest really in this review. Originally HP had a fairly standard matte AG coating on the screen when it was using the SDDA revision of the panel. It was perhaps a little lighter than some other IPS based models we had seen but was still what would be considered as an aggressive AG solution. That type of coating can lead to a dirty, grainy appearance, especially on light and white images. Here on the updated v2 of the screen the SDDB panel has brought about a change in the screen surface. It is now a lighter AG coating. It is very comparable to what we saw on the recently released Dell U2713HM in fact. LG.Display seem to have toned down the AG coating which is great news on recent IPS panels and that is true here on the updated revision used in the new ZR2740w. It retains its anti-glare properties to avoid unwanted reflections, but does not produce an overly grainy or dirty image that some AG coatings can. At the time of the original review we were not testing screens for their use of Pulse Width Modulation (PWM) unfortunately. A few months ago we made an amendment to the review to mention the fact that other reviews had identified that the ZR2740w does NOT use PWM to control backlight dimming. This is still quite a rare thing in the modern LCD market, and is worth mentioning. We now have the chance to test the screen ourselves using our PWM tests, not to mention verify whether anything has changed with the slightly updated panel. We tested the screen to establish the methods used to control backlight dimming. Our recent article talks in more details about a common method used for this which is called Pulse Width Modulation (PWM). A series of photos was taken using the method outlined in the article. These were taken at maximum, middle and minimum brightness levels (in the absence of an OSD menu or brightness adjustment %). These tests allow us to establish 1) whether PWM is being used to control the backlight, 2) the approximate frequency at which this operates, and 3) whether a flicker may be introduced or potentially noticeable at certain settings. We can confirm that the ZR2740w does not use PWM at all for dimming of the backlight, including with the slight panel change on this v2. Even at 0% brightness there was no sign of the usual splitting of the white line that you'd expect to see in these tests. We carried out the checks at an even slower shutter speed which returned the same result. This is great news for those who are affected by flickering backlights and suffer from eye fatigue and eye strain. 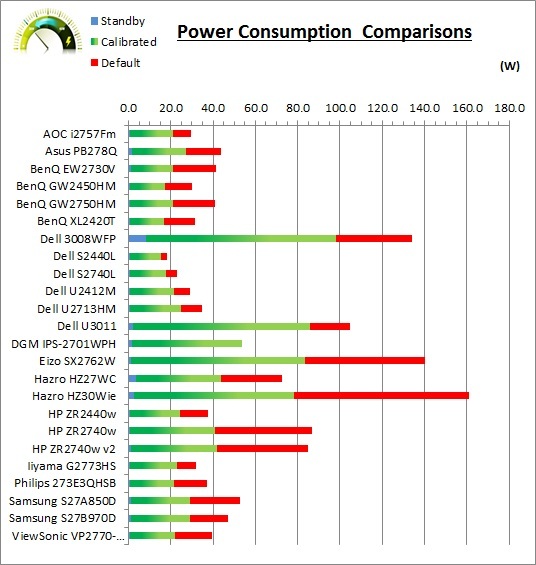 It seems we have seen quite a few new monitors recently which don't use PWM for backlight dimming including other 27" models like the DGM IPS-2701WPH, ViewSonic VP2770-LED, Samsung S27B970D and Dell U2713HM. You will notice that the default settings of the screen pretty much all show "n/a" above. As already discussed that is because there is no OSD menu available on the ZR2740w and so the only setting you can change is the brightness control. This was left at the default setting for this initial measurement. According to the Display Assistant software this was at 90%. 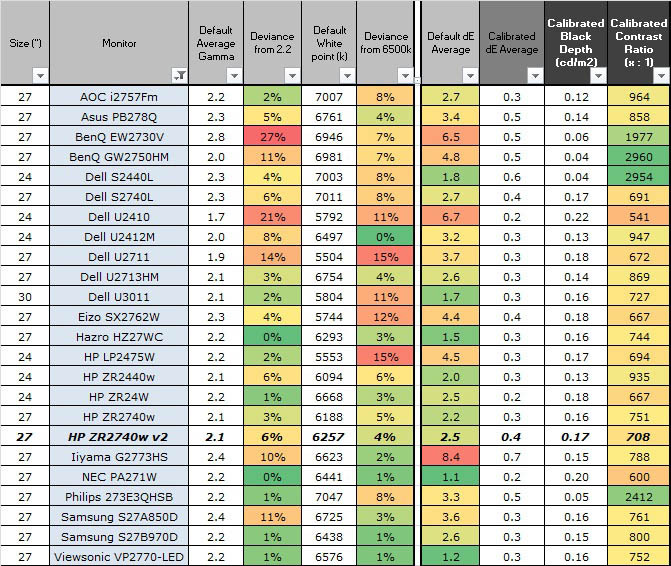 The out of the box performance of the ZR2740w v2 was good in most areas. It was very comparable to what we'd seen from the original version of the ZR2740w so presumably the panel change has not impacted this much and the units still go through the same level of factory setup. The CIE diagram on the left confirms that the monitors colour gamut (black triangle) closely matches the sRGB colour space (orange triangle). It extends a little past the sRGB space in greens and blues in this 2D view of gamut and this seems to match the spec from the panel which informs us that it can cover 99.9% of the sRGB reference space. 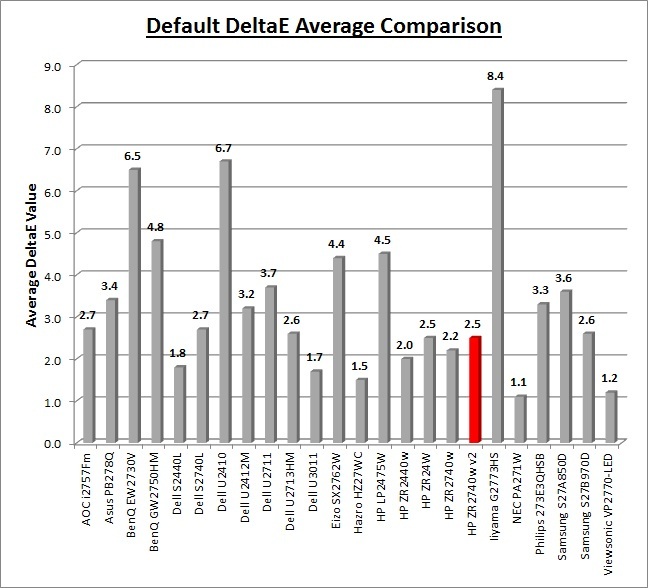 Default gamma was recorded at 2.1 average, leaving it 6% out from the target of 2.2. Gamma was actually closer to the target of 2.2 in the darkest greys where it was recorded at 2.17 but this deviate as low as 1.97 however in other lighter shades showing a discrepancy in the gamma curve. 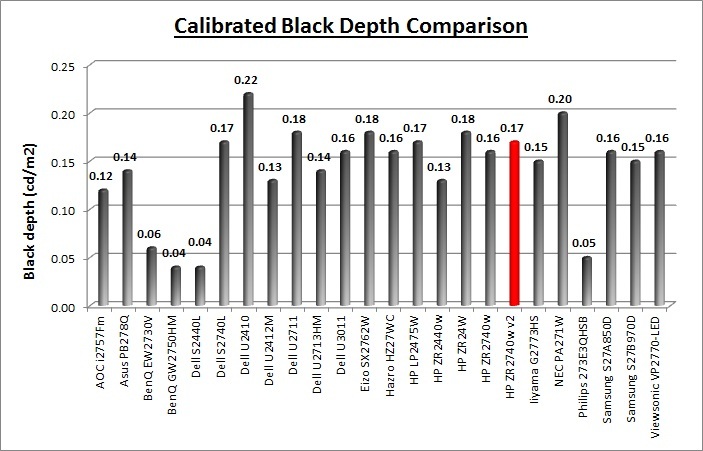 We had seen a slightly smaller deviance from the original ZR2740w of 3% in the overall gamma. White point was only a little out here at 6257k which was 4% out from the target. This was ever so slightly closer than the original version of the screen which had been measured at 6188k (5% out). Note that we are using a Spectrophotometer to make these measurements which is not sensitive to the W-LED backlight as some colorimeter devices can be. When using a standard gamut colorimeter with a W-LED backlit screen there can be a typical deviance of 300 - 600k in the white point measurement which is why some sources may refer to a different white point in this test incorrectly. Luminance was recorded at an incredibly high 418 cd/m2 which is way too high for comfortable use. This was a little lower than the original version of the screen (456 cd/m2) but it was still far too high and even higher than the specification suggests (380 cd/m2 max brightness). At this high 418 cd/m2 luminance, the black depth was 0.47 cd/m2. This gave us a static contrast ratio of 886:1 which is very good for an IPS panel but a bit lower than the native contrast ratio we'd seen from the original version (986:1). Like with that version though, given the variance in other areas like gamma, this will likely change once we have calibrated the screen to correct the other areas. Colour accuracy was fairly good at default factory settings with an average DeltaE (dE) of 2.5, ranging up to a maximum of 3.8. The screen felt fairly even at least to the naked eye, although as with most screens out of the box it was overly bright. Some minor adjustments to the brightness control can hopefully help improve the default set up for casual users who don't have access to a hardware calibration device. To be fair though this kind of out of the box set up should be fine for most casual users anyway, and they can just adjust the brightness control to suit their working environment. Colour gradients showed smooth transitions with some slight gradation at the darker end. No banding was evident. In many regards the default setup is basically the same between the two screens. The most notable difference seems to be the lower default contrast ratio on the new version which is down from 986:1 to 886:1. Still pretty high for an IPS panel and should be adequate for most users certainly. Adjustments were made during the process to the brightness control only since there were no other hardware changes possible. For clarification we followed the guidelines of the software and ended up with a brightness setting which was 63 steps up from the minimum setting (a setting of 25% according to the HP Display Assistant software). After this I let the software carry out the LUT adjustments at a graphics card level and create an ICC profile. 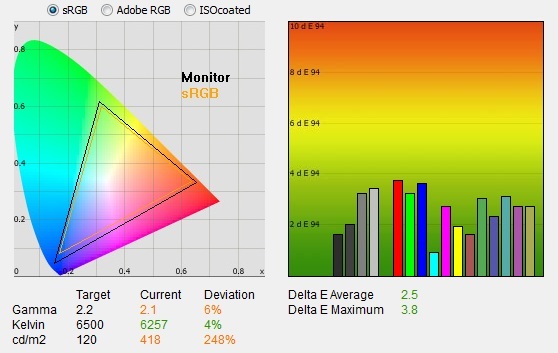 The screen does not feature a hardware LUT calibration option so other than the brightness alteration the rest of the process is carried out at a graphics card level in profiling the screen. The calibration was a success. The gamma discrepancy that we saw before (4%) had been corrected now on average to leave us with 0% deviance and an average gamma of 2.2. White point was also corrected to 6531k, bringing it <0.5% out from the target. Luminance had been reduced to a more comfortable 120 cd/m2 thankfully after the adjustment of the OSD brightness control. Black depth was still fairly good at 0.17 cd/m2 and this gave us a calibrated static contrast ratio of 708:1 which was just shy of the 751:1 calibrated contrast ratio we'd seen from the original version of the screen. This was a bit less than default settings (886:1) but corrections had been made to the gamma curve and greyscale which impact contrast ratio here. 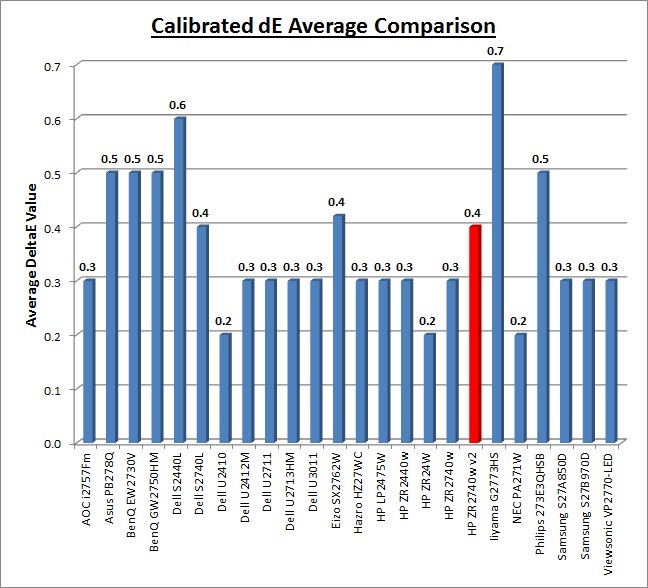 Colour accuracy was also improved nicely with dE average now only 0.4 and maximum only 1.5. LaCie would consider colour fidelity to be excellent overall. Testing the screen with various colour gradients showed mostly smooth transitions. There was some slight gradation in darker tones and some banding evident due to the profile adjustments made here. Nothing too major though that would be noticeable in most normal uses. It's worth also commenting on the screen coating in this section of the review. Unlike many other competing IPS panels, including the older version of the ZR2740w, this screen does not feature the usual heavy and aggressive Anti-Glare (AG) coating which can sometimes lead to grainy and dirty looking images. Instead it uses a light AG screen coating similar to that of some other modern IPS panels and competing PLS offerings. As a result the colours look more clean and crisp, the image quality is sharp and whites in particular look more pure than they do on heavy AG coated screens. It isn't a full glossy solution which adds another level of clarity and changes the overall feel of the screen, but it is an improvement over the heavy AG coating of some alternative IPS screens. Default setup of the ZR2740w v2 was pretty good when it came to gamma and white point. 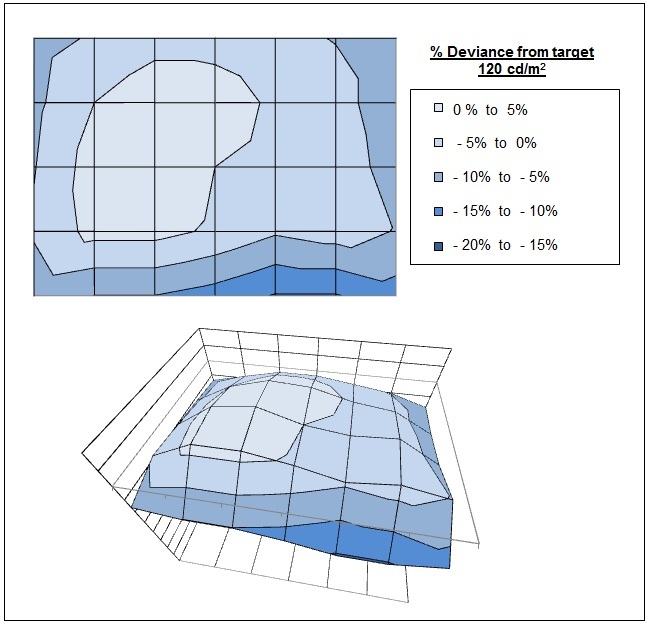 There was a small 6% deviance in gamma and a slightly lower 4% deviance in white point. This represented a pretty good factory setup, much like we'd seen from the older version of the screen in fact. Colour accuracy was reasonable as well with dE average of 2.4. Not a bad default setup and it was good to see an accurate coverage of the sRGB colour space as well. It would have been nice if the gamma and white point were slightly better perhaps but it was nothing too significant which should bother an average user. Default colour accuracy is compared again on the above graph, with the ZR2740w v2 having a reasonably reliable default setup which is pleasing. The calibrated black depth and contrast ratio of the ZR2740w v2 were ok, but not great by some modern IPS standards. At a contrast ratio of 708:1 it was pretty close to the original version of the screen after calibration (751:1). It was however not as high as some other modern IPS panels we have tested such as the Dell U2412M (947:1) and the 27" competing Dell U2713HM (869:1). The contrast ratio should be adequate for most uses though, we had just hoped for a little more from a modern IPS panel. The AMVA based screens shown here can reach much higher static contrast ratios of ~3000:1 which IPS cannot compete with at the moment. The luminance range of the screen was excellent. At the top end the panel reached a massive 458.79 cd/m2 which was much higher even than the specified maximum of 380 cd/m2, and should be far more than most users would ever need as an upper limit. The old version of the screen could reach slightly higher still at ~502 cd/m2. At the lower adjustment end it could reach down to a very low 30.44 cd/m2 meaning the screen should be perfectly fine even in darkened room conditions, and for those who like to run at a lower luminance setting. A brightness setting of ~20% (a measured in the Display Assistant software) should return you a default luminance of around 120 cd/m2 as well. Black point ranged from 0.52 cd/m2 down to 0.03 cd/m2 with the backlight adjustments. We have plotted the luminance trend on the graph above. The screen behaves as it should, with a reduction in the backlight intensity controlled by the reduction in the OSD brightness setting. This was pretty much a linear relationship overall, with any slight deviation probably down to the settings within the HP Display Assistant software being used to control the backlight. 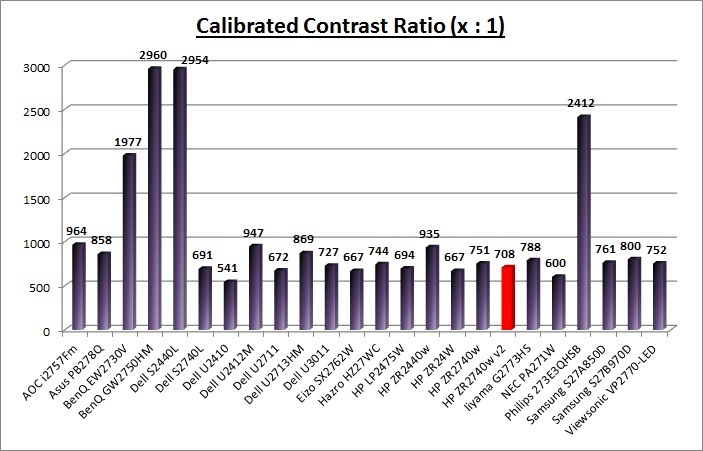 Average contrast ratio measured was 894:1 which was very good for an IPS panel. It was pretty stable across the adjustment range with some small deviations at the lower end of the brightness scale. Again this was slightly lower than on the older version of the screen which averaged at 973:1. There is no dynamic contrast ratio available on this screen so we will not have a specific section in this review testing that feature as we would normally. Nothing has changed here since the original review. Viewing angles of the HP ZR2740w and ZR2740w v2 are very good, as you would expect from a screen based on an IPS panel. Horizontally there are very wide fields of view with a small contrast shift only really becoming noticeable from a fairly wide angle of about 45°. At more extreme angles the image goes a little darker and a slight pale tint is introduced. Vertically, the contrast shift was a little more pronounced but the fields of view were still good. The panel is free from any off-centre contrast shift which you see from VA matrices, and this is why IPS technology is so highly regarded in the colour enthusiast and professional space. It is also free of the very noticeable contrast and colour tone shifts you see from TN Film panels vertically. If you are viewing dark content from a close position to the screen you can sometimes see this pale glow on parts of the screen towards the sides and corners because of your proximity to the screen and your line of sight. The edges of the screen are at an angle from your line of sight which means you pick up this white glow to a smaller degree. This disappears as you move backwards away from the screen where the line of sight does not result in a wide angle view of parts of the screen and you can see the screen largely from head on. With such a large screen size this could have potentially caused a big problem but thankfully the glow is actually quite low I thought and it did seem better than the ZR2240w model in fact. This glow should not be mistaken for backlight bleeding which would not disappear as you changed your line of sight or angle of viewing. The luminance uniformity of the ZR2740w v2 was very good. Approximately 85% of the screen was within 10% deviance of the central 120 cd/m2. point which was great news. The lower right hand corner seemed to show the most variation, where luminance dropped down to 104 cd/m2 along the lower edge in the most extreme cases (-15% deviance). Overall though, a good result here. As usual we also tested the screen with an all black image and in a darkened room. A camera was used to capture the result. There was no backlight leakage noticeable at all which was excellent. The camera picked out some very slight clouding from the corners but this was hardly detectable. An excellent result from the ZR2740w v2 here. A large part of what we said before about the original ZR2740w stands here as well of course, although we have added some further thoughts as well since we originally tested the screen. 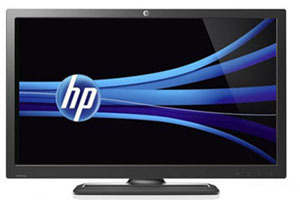 The HP ZR2740w (both versions) feature a massive 2560 x 1440 WQHD resolution which is only just a little bit less vertically than a 30" screen. The pixel pitch of 0.233mm is very small as a result, and by comparison a standard 16:10 format 24" model has a pixel pitch of 0.270mm and a 30" model has 0.250mm. These ultra-high resolution 27" models offer the tightest pixel pitch and therefore the smallest text as well. We found it quite a change coming from 21.5 - 24" sized screens, even those offering quite high resolutions and small pixel pitches. Some users may find the small text a little too small to read comfortably, and I'd advise caution if you are coming from a 19" or 22" screen for instance where the pixel pitch and text are much larger. I found a 30" screen to be quite a change with text size when I first used one, and this is very similar and even a little bit smaller! I still personally prefer the slightly larger text of a 24" model myself, but I expect I could happily get used to the added resolution on these models given time. The extra screen size also takes some getting used to over a few days as there really is a lot of room to work with. The massive resolution is really good for office and general use, giving you a really big screen area to work with. It is a noticeable upgrade from a 24" 1920 x 1200 resolution, and it's good to see HP have opted for the high res panel here rather than sticking with another 1920 x 1200 / 1920 x 1080 res panel as you may find in other older 27" models. For those wanting a high resolution for CAD, design, photo work etc, this is a really good option. The image was very sharp and crisp and text was very clear. With its WQHD display, you enjoy 77% more desktop space than a full HD screen to spread out your windows and palettes. The change by HP to a lighter AG coating is also a very positive move when it comes to these kind of uses. The new lighter coating ensures that white backgrounds of office documents looked good, and did not suffer from the overly grainy and dirty feel of some competing IPS panels featuring heavy, aggressive AG coating - including the older revision of this screen. It also remained free from the reflections you might experience from a full glossy solution so seems to be a good half-way between the two. The wide viewing angles provided by the IPS panel technology on both horizontal and vertical planes, helps minimize onscreen colour shift when viewed from different angles. The default setup of the screen was reasonable in terms of gamma and white point which should produce a decent image for office work. Colour accuracy was also pretty good and so default setup should be fine for many users. 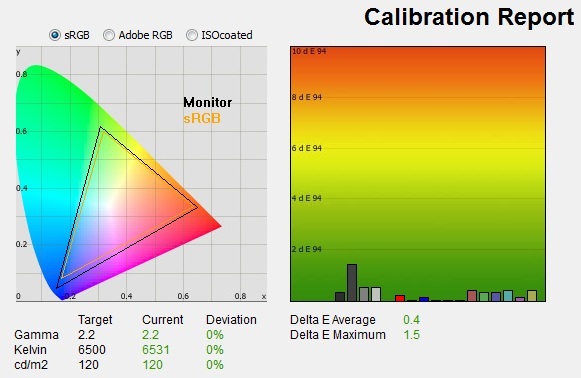 If you follow our basic OSD adjustments from our calibration process (and maybe also try our calibrated ICC profile) you should be able to get a better setup, even without a colorimeter of your own. There were no preset modes available from either screen as there was no OSD menu available. HP have cut a few corners here to keep costs down presumably, and so there are basically no setting you can change. Since there are no presets or different modes, you will have to change the backlight control each time if you want to have a different setting for movies or games than you do for day to day use. Out of the box the luminance was far too high and so you will want to turn this down significantly to obtain a setting comfortable to you in your lighting conditions. A setting of around 20% (as identified via the HP Display Assistant Utility) should give you a luminance of around 120 cd/m2 out of the box. The brightness control affords you a very good range of adjustments as well, allowing you to go up to ~459 cd/m2 if you really wanted to, and down as low as ~30 cd/m2. 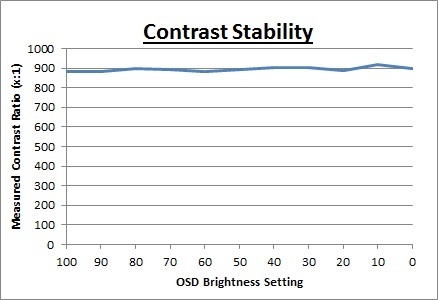 Even those wanting to use the screen in low light conditions should find the adjustment range more than adequate. Another thing to note while we are talking about the brightness control is that the screen does not use Pulse-Width modulation (PWM) to control backlight dimming and so those who suffer from eye fatigue or headaches associated with flickering backlights need not worry here. The screen offers a 4 port USB 2.0 hub which is useful, especially with 2 ports located on the left hand edge for easy and quick access. There are no other extra features available such as ambient light sensors, card readers or integrated speakers. There was a good range of ergonomic adjustments available which were all pretty easy and smooth to use. The screen even offers a rotation function which is probably impractical at this size. The VESA mounting support may also be useful to some people. With DisplayPort and DL-DVI both supporting the full 2560 x 1440 resolution you should have a decent choice for your PC connectivity. The screen is designed to run at its native resolution of 2560 x 1440 and at a 60Hz recommended refresh rate. You will need a Dual-link DVI output or DisplayPort from your graphics card in order to handle that resolution. However, if you want you are able to run the screen outside of this resolution. We tested the screen at a lower 1920 x 1080 resolution to see how the screen handles the interpolation of the resolution. At native resolution the text was very sharp as you can see from the top photograph. When you switch to a lower resolution the text is a lot more blurry. There was a high amount of overlap of the pixels but text was still readable if you had to. I would recommend native resolution wherever possible for maximum picture quality and screen real-estate. The ZR2740w is rated by HP as having a 12ms G2G response time which implies the use of overdrive / response time compensation (RTC) technology, used to boost pixel transitions across grey to grey changes. This has not changed at all with the new revision. Unlike the smaller ZR2240w model there was no 'Video Overdrive' mode available since that was a feature in the OSD menu of the smaller screen, which is lacking here. As such you don't have any control over the overdrive impulse applied to the panel, it is always in the same state. The panel being used is the LG.Display LM270WQ1-SDDB (previously the SDDA revision). Have a read about response time in our specs section if any of this is new to you. In practice the HP ZR2740w v2 showed fairly low levels of motion blur although some was detectable to the naked eye and picked up in these tests. There was nothing severe and no obvious ghosting which was good. It seems that the overdrive impulse being applied is fairly modest and so we are left with a small amount of blur, and no way to turn the overdrive up or down due to the lack of any OSD menu. At least with this modest overdrive impulse there was no overshoot problem which can often manifest itself with dark or pale halos and trails behind moving objects if the overdrive is applied too aggressively or poorly controlled. If we compare the new revision with the old you will see there is basically no change at all in practice between the two revisions. The panel itself is basically the same, with a slightly updated revision to account mainly for the reduced AG coating. The electronics and overdrive circuit will also be the same and so in practice there's no difference between the two models when it comes to response times. We have provided a comparison of the ZR2740w v2 above against 4 other 2560 x 1440 resolution 27" screens we have tested which all use IPS (or the very similar PLS) panel technology. The ZR2740w v2 showed a reasonable result in this test. There was some motion blur evident but nothing too severe, although this blur was a little less on the Dell U2713HM and Asus PB278Q. There was no obvious ghosting and no artefacts caused by the RTC impulse which was pleasing on the ZR2740w, something which you can see affects the Dell U2711 quite noticeably in the form of a dark trail. The Hazro HZ27WC features a very similar panel (different version of the LM270WQ1) to the ZR2740w v2 but did show a slightly better performance in these response time tests. We can also compare the ZR2740w v2 against a couple of other 27" models, this time with lower 1920 x 1080 resolutions. The AOC i2757Fm and Dell S2740L show a smoother moving image than the HP in practice with a less noticeable blur to the moving image. However, in the case of the Dell, a dark overshoot is again introduced due to an aggressive overdrive impulse. The BenQ GW2750HM is a little different as it is based on a 1920 x 1080 resolution AMVA panel and not IPS technology like the others here. It was quite comparable to the ZR2740w v2 overall, but it did show some dark trailing, but not quite as noticeable as on some of the other models we have discussed. The responsiveness of the ZR2740w v2 was pretty good overall and remained unchanged from the original version of the screen in practice. The blurring was at a reasonably low level although it was a little more pronounced than some other competing models, perhaps a reasonable reflection of it's slightly higher quoted response time of 12ms G2G. Thankfully because the overdrive impulse was evidently quite modest, there were no overshoot artefacts introduced which was positive news. The screen should be capable of handling a fair amount of gaming, even some fast paced games, although you may want to consider the type of graphics card required to run games with high settings at such a high resolution. Aspect Ratio Control - Like the original version, the ZR2740w v2 does not offer any form of aspect ratio control options since there is no OSD menu available. All inputs will be interpolated to fill the screen unless you have a way to control the aspect ratio via the graphics card or specific input device. For gaming and for connection of external devices it would have been good to feature hardware level aspect ratio control certainly and it is missed. Most modern graphics cards should be able to offer some degree of aspect ratio control, but for any external games consoles (or DVD / Blu-ray players) this lack of hardware level control could present an issue. The original HP ZR2740w was tested using our older, more limited, stopwatch method. Since nothing has changed here in terms of scalers or electronics the input lag should be the same between old and new versions. This presents us with the opportunity of more accurately measuring the input lag of the ZR2740w using the new, improved SMTT method. Results from the original ZR2740w review should be discarded as although they were the best method we had available at the time of writing, the SMTT method is more accurate. The HP ZR2740w v2 shows a very low level of input lag. This was measured at 3.6ms average. Note that this is the overall display lag, and so accounts for the signal processing time + an element of the pixel response time. The lag of this screen has been categorised as CLASS 1 as detailed above. It should be perfectly fine for gaming as a result, even for fast paced FPS. 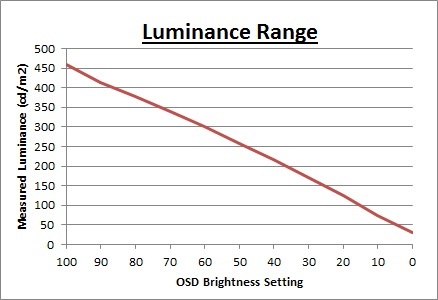 Wide brightness range adjustment possible from the display, including very high maximum luminance of ~459 cd/m2 and a good minimum luminance of ~30 cd/m2. This should afford you very good control for different lighting conditions. Black depth and contrast ratio are reasonable for an IPS panel at 708:1 after calibration (894:1 before calibration). Shadow detail in darker scenes should not be lost though as it's adequate. No hardware level aspect ratio control options at all which may be problematic for connection of external devices, DVD players etc. The screen is a native 16:9 aspect ratio so much content should be ok anyway, but it would have been useful to see some kind of scaler included here. For PAL sources, we have tested the screen and confirmed it will not support the full native resolution of 2560 x 1440 at 50Hz refresh rate unfortunately. Much of what we said at the time of the original review still stands as we test this new revision approximately 1 year on. The ZR2740w v2 had some good areas but some which left us a little disappointed. From a positive point of view, the default setup was pretty good apart from the overly high brightness which is easy to adjust. In fact the brightness adjustment range was massive and really did give you a huge potential range to play with. The added benefit of the screen not using Pulse Width Modulation was also positive news, something which we were able to verify with this new review. Viewing angles were as you would expect from an IPS panel and luminance and backlight uniformity seemed good. 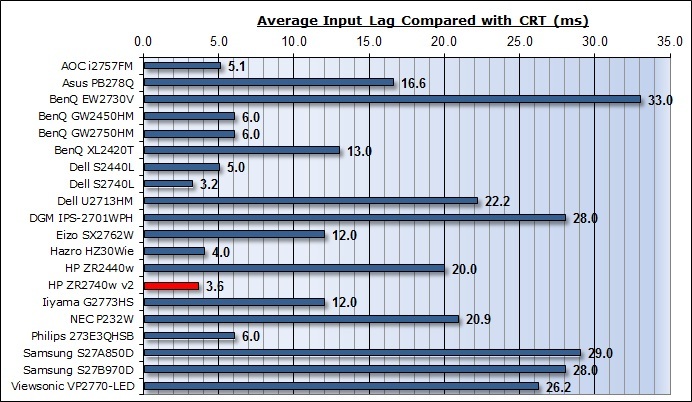 Pixel response times were pretty good and input lag was very low, largely because there is no scaler on this model. There was a very good range of easy to use ergonomic adjustments and the presence of DisplayPort was welcome along with the DL-DVI. The support of 10-bit content through the 8-bit + AFRC panel may also be welcome to some users with the appropriate workflow. Perhaps the biggest disappointment with this model (and the older revision) in my opinion was the lack of an OSD menu. This meant you had very limited control over the hardware for calibration and setup. It meant there were no preset modes (even colour temperature modes like on the ZR2240w), no RGB channels to adjust, no hardware level aspect ratio control, no dynamic contrast ratio, no overdrive control. All in all I think this was a shame and it did make the screen feel a little bit more limited than others. The black depth and contrast ratio were also a bit lower than we had maybe hoped for given our tests of other modern IPS panels which have impressed in this area. The screen is available now from ~£585 GBP (inc VAT). This makes it a little more than other competing models like the Dell U2713HM (£530) and Asus PB278Q (£500) but is still an interesting option as an alternative, and should be backed by a good warranty and product support from a company like HP. Overall I think the screen fits a niche reasonably well as a standard gamut 27" IPS display with a matte panel coating, now improved to a lighter AG thanks to the slight panel change. Still worth considering if you're looking for a large screen and the AG coating change made with this latest revision can only be a good thing.